HP Laserjet 1010 printer is a black & white laser printer. Lots of hp lj1010 printer users have been requested us to provide its driver for Windows 10 and Windows 7 OS. Today, on this page we are going to provide you the driver with the step by step instruction how to download HP Laserjet 1010 driver and how to install it on Windows XP, Vista, Windows 7, 8, 8.1, Windows 10, Server 2003, 2008, 2012, 2016 32-bit / 64-bit operating systems. Go to the download section to download the drivers. In order to download the driver, first you need to know the exact version of the operating system installed on your computer. Then download the same OS driver from following list. First you require to determine your operating system version. Then go to the download section below and click on the download to download HP LaserJet 1010 (BOISB 0207-00) driver from there. for Windows 10, 8, 7, Vista, XP, Server 2000 to 2016 32-bit / 64-bit, Linux, and Mac OS X. What is Basic Driver and how to install it? 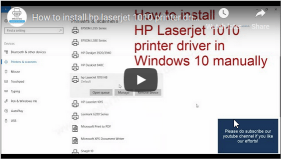 We have made a video tutorial which will explained in detail how to install hp laserjet 1010 printer driver in Windows 10 manually. HP official website is not providing the HP laserjet 1010 driver for Windows 7, 8, 8.1, 10 operating systems. However, it doesn’t mean you can’t use this printer on these opertaing systems. You can easily install HP laserjet 1010 printer on these OS using its basic driver manually. Click here to know how to install hp laserjet 1010 printer’s basic driver on a computer manually. If above basic driver doesn’t work for you then you have to install Dot4 driver and HP universal driver. First you need to install Dot4 exe file and then install HP universal drivers manually. These drivers are given below, please try it once. You may ask your question about downloading & installing the printer driver, we’ll be happy answer you there. You can download the same drivers directly from HP laserjet 1010 official website. There are two types of drivers are available for hp 1010 printer, basic and full feature driver. Basic driver has drivers only (No software included). Full feature driver package has its software along with the drivers. Sometimes, full feature driver is unable to install due to many reasons. In this case, you can use its basic driver, it will install easily without any hassle. 1. Install HP LaserJet 1010 Printer with software CD. You’ll require a CD/DVD Drive installed on your computer. Need a Software/Driver CD Disk of HP LaserJet 1010 printer, which came with the printer. Require a USB cable, which will connect your printer to computer. It came with the printer. Follow the steps to install this printer with CD Drive. Turn it on your computer, which you need to install Hp LaserJet 1010 printer on it. Turn it on HP LaserJet 1010 printer as well. Keep unplug the printer’s USB cable (Do not plug it until prompts). Insert Hp LaserJet 1010 CD disk into the CD/DVD drive on your computer, and run the setup wizard of CD, and follow their instructions to install it. Now connect the printer’s USB cable to computer, when installer wizard asks (Note: Do not plug before asking). Wizard will analyzing when you connect it. After recognized the printer, it will automatically go to further steps. Note: Wait until it’s finished detection of printer. After finished, your printer will be installed and ready to use. 2. Install HP LaserJet 1010 Printer without driver CD. Follow the steps to install the printer with Setup File. Turn it on your computer, which you need to install the printer on it. Turn it on the printer as well. Keep unplug the printer USB cable (Do not plug it until prompts). Download Hp LaserJet 1010 drivers setup file from above links then run that downloaded file and follow their instructions to install it. Now connect the printer’s USB cable to computer, when installer wizard asks (Note: Do not plug before asking). Wizard will analyzing when you connect it. After recognized the printer, it will automatically go to further steps. Note: Wait until it’s finished detection of printer. Need a Software/Driver Setup file of 1010 pritner. You can download it from above links, according to your Operating System. Follow the steps to install Hp LaserJet 1010 printer Manually. Connect the printer USB cable from Printer to computer. lick on Add a Printer. After finished, you’ll get installed your Hp LaserJet 1010 Printer ready to use. If your printer stopped working after windows upgraded to windows 10 or win 7 then you have to re-install the driver again. If you have any question regarding your HP 1010 driver then let us know we’ll help you. Question: Plz send driver - hp laserjet 1010 Windows 7 - 32bit. Answer: You can install HP laserjet 1010 windows 7 driver through "Windows Update". Do update your windows, make sure the printer is turned on and connected to the computer via USB cable. Question: I had a hp printer and having the same printing issue. I reisntall its driver and then my print worked smoothly on my laptop. I want HP laserjet 1010 driver. I was Searching for it but couldn't found them online. Please send me the HP laserjet 1010 printer driver for windows xp 32bit. Answer: Windows xp driver for HP laser jet 1010 available for download. In order to download, go to the download section above, all the drivers are listed in the list there. Download the driver from the list. Question: Can't find drivers for hp LaserJet 1010 for windows 10. Answer: For Windows 10, you'll have to install its basic driver manually. We are giving you Windows 10 basic driver. Click here to download Windows 10 32bit basic driver / Windows 10 64-bit basic driver. Click here to get a guide on how to install HP printer's basic driver manually. Question: I cannot download printer driver. plz send me the driver for hp laserjet 1010 for windows 8 or any other option. Answer: Windows 8 driver is not available for download even on HP official website. However, you can still install the hp 1010 printer on Windows 8 OS using its basic drivers. Follow the following steps how to do. Click here to download Windows 8 32bit basic driver / Windows 8 64-bit basic driver. Question: Will HPlaserjet 1010 run on osx 10.13.6? Answer: Mac OS X 10.3.6 driver is not available for download even on HP official website. You may try one thing to install this printer on MAC. Plug your printer to the Mac computer, make sure it is turned ON. After that do update your MAC OS to the latest version, maybe it gets the driver. Answer: Sorry for the inconvenience. We just have corrected the mistake and added a NEW basic driver for Windows 10. Click here to download HP laserjet 1010 basic driver for Windows 10 32bit basic driver / Windows 10 64-bit basic driver. Click here to get a guide on how to install HP printer's basic driver manually. Question: I am using window 8, 64bit OS. Kindly help on how to download laser jet 1010 printer. Answer: Click here to download 1010 basic driver for Windows 8 64bit. As it is a basic driver, you'll have to install it manually. Here is an example of how to install HP basic driver manually on your computer manually. Question: Please help me with hp1010 printer drivers windows 7 64bit. Model number: hp1010 cnfj387244 q2460a. plz install my device. Answer: To install HP 1010 driver on Windows 7 computer, you'll have to download its basic driver and install it manually. Question: How can I remove pending for printing docs & print new one only, hp laserjet 1010? Answer: You can easily clean your print queue by following the steps on how to clean print queue. Question: HP laserjet 1010 BOISB 0207-00 driver download for Windows 7 64bit. Answer: Click here to download HP laserjet 1010 basic INF driver, you'll have to install it manually. We have made a video tutorial on how to install HP Laserjet 1010 basic driver manually on a computer. Windows 7 drivers are not available even on HP offical website. So, we cannot give you the solution for windows 7 as of now. We also have updated all the links of HP laserjet 1010 printer drivers please check them again. For which operating system? Anyway, all the drivers are already listed on this page download section. You can easily download it from here. If still can’t find then let us know your operating system we’ll give you the direct link. Previously installed and used hp 1010 printer on my windows 7 system. Something happened and it appears the driver data on the system have been removed. I have tried to reinstall the driver without any success. Is there any remedy? You can use windows vista drivers for windows 7, maybe it will work but we are not sure about it. You can easily download the drivers of this printer any time from Internet, so there is not need to send and keep driver. To download HP 1010 printer driver just go to the page driver download section and lick on your windows OS link. Let us know again if you need more help regarding download the drivers. You are on the correct page. All the drivers of HP laserjet 1010 listed here in this page download section. Just go to the download section of this page and click on your operating system hyperlink. Let us know again if need more help regarding driver download issue. Recently converted to new Dell Inspiron 3847 with windows 10. HP P1005 Does not work. Understand you are producing update in near future -please advise position. We just have updated HP 1005 windows 10 drivers for download and for windows 8.1 drivers as well. Go to the download section of the given page and click on the windows 10 driver hyperlink. I am using windows 10, why can’t I download laserjet 1010?? Because windows 10 already have the inbuilt driver for Laserjet 1010 printer. Do windows update to get drivers after connect your printer to computer. I am using windows 7, 64 bit OS. I am unable to get drivers for HP Laserjet 1010 printer. Please provide me downloadable link for the same. Thank you. Drivers for Windows 7 64bit is not available even on hp official website. Maybe windows 7 Os will update and install drivers automatically when you hook up the printer. Windows 7 already have inbuilt drivers of HP laserjet 1010 printer. Sorry to say but there is no drivers available for Windows 7 64bit OS. Windows 7 driver is not available for download even on hp official website. We recommend you to do update your windows while connecting this printer to your computer. HP laserjet 1010 Windows10 64bit driver is not available for download ( You can check its official website as well). 1. Connect your printer with the USB to your computer and make sure it is turned ON. 2. Go to printer’s page and then install printer by clicking on “Add a printer” option. Install printer manually. When the wizard ask for driver then there is “windows update” button on the wizard, press this button, it will install the printer automatically. 1. Download the above driver and run it on your Windows 10 PC. Let it be extracted to %temp% folder (sometime this location could be different). 2. Now click on “add a printer” option from printer’s page and give the driver path where the downloaded driver has been extracted. It will auto install the driver. Reply back if need more help, we’ll be happy to assist you more. You’re welcome!! Have a great day ahead!! Both drivers (HP 3015, HP Universal Driver) will work well. Please explain your problem with detail. We’ll help you certainly. I have had an update, I am using windows 10.
my HP laserjet 1010 will not work. I removed the drivers – HP universal PCL 5 and HP Laserjet1010. I downloaded again – but cannot find 1010 drivers on the list. In this case, you have to use HP Laserjet 1010 basic driver and install it manually on your Windows 10 computer. Click here to download HP laserjet 1010 printer’s basic driver and then here is a guide on how to install a basic driver on Windows-based computer. Thanks for sharing your experience. Yes, this way will work as well. We suggest you to try lvnt’s steps.